So why Sri Lanka and not a pan-India ride to celebrate you ask? For starters, Sri Lanka is of strategic importance for TVS as a market. 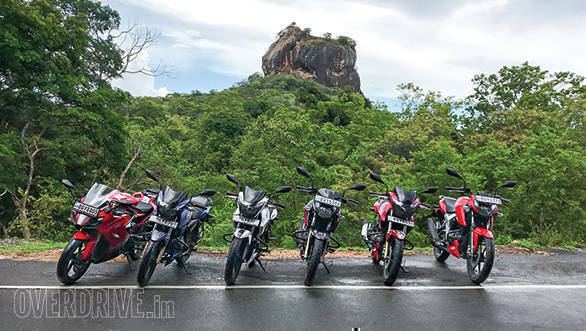 On another note, the country is known for its culture, picturesque hills and scenic beaches, so TVS Motor was keen on us riding the entire line-up of Apaches for 1000km across Sri Lanka. The country's regulations necessitate foreigners to procure a local driving license though, so the first thing we did on landing in Colombo was head to the transport office and get in a queue! Thanks to TVS Lanka, a wholly owned subsidiary of TVS Motor and other local support getting our Sri Lankan licenses was a quick affair and within an hour we were handed A4 sized printouts mentioning we can ride motorcycles or drive passenger cars in Sri Lanka for up to a month. 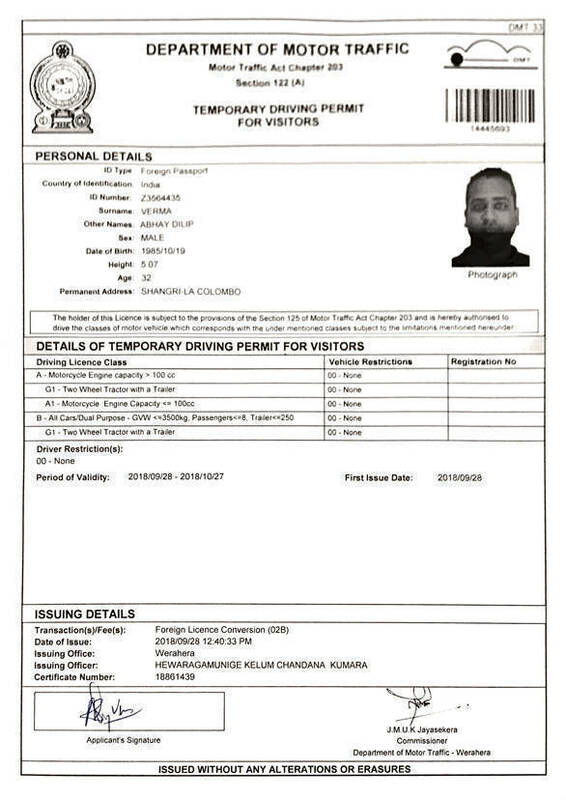 That's what a termporary Sri Lankan driving license looks like! Given the large number of TVS vehicles on the road it didn't take me time to realise the market's importance for the brand and I also noted that TVS Motor sells almost all scooters and motorcycles it sells in India, in Sri Lanka as well. It also sells the Apache 150 there, as motorcycles displacing up to 150cc are eligible for a tax concession. 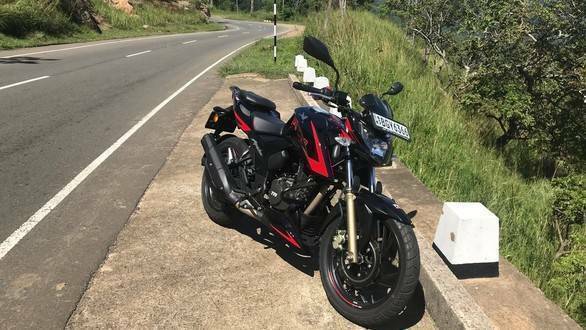 The 150 is styled just like the older Apache RTR 160 and we were also informed that the Apache 150 is quite a hit in Sri Lanka. 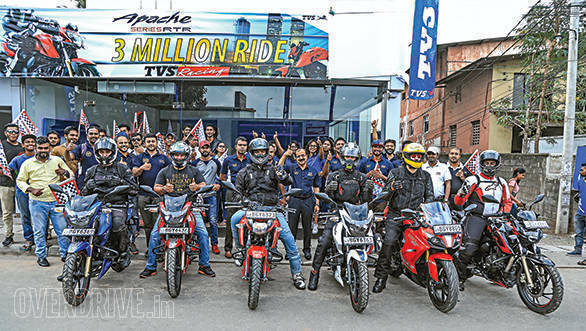 The Apache RR 310 hasn't been launched yet, though all other Apaches including the older Apache RTR 160, RTR 160 4V, RTR 180 and RTR 200 are sold in Sri Lanka. TVS Motor did ship an RR 310 for us specially and needless to say, it was the cynosure of all eyes. I chose to ride the Apache RTR 200 4V first, as it is an interesting evolution of the Apache series and was the flagship Apache before the RR 310. As a 20PS motorcycle it is an interesting prospect for buyers spending about a lakh rupees on a bike with its performance and handling. 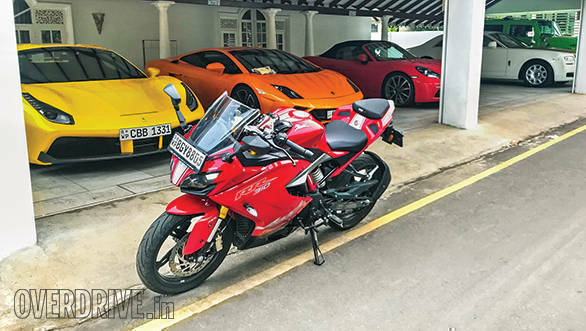 Its engine is also more refined than the smaller RTRs, while the addition of a slipper clutch and ABS recently have helped TVS up its game in the 200cc category. Our ride began from a TVS dealership where we were flagged off by a bunch of enthusiastic Apache owners. 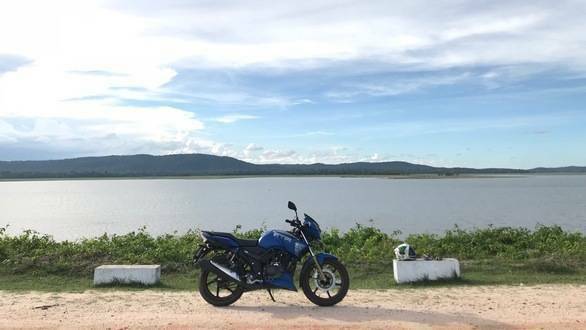 Getting out of Colombo's peak hour traffic was a breeze on the RTR 200 and the countryside changed drastically soon after we got out of town, leaving the beaches behind. The terrain got hilly and traffic thinned out, allowing me to explore the 200's potential. The fact that you have the option of going in for stickier Pirelli tyres on the 200 is a bonus, as the tyres make a big difference to confidence levels. The ride on day 1 sprung a surprise though. The itinerary included a trip to Meemure, a remote Sri Lankan village in the Knuckles Mountain Range near Kandy. The village has no cellular network even today and is accessible only via a broken road off the main highway. The highway offered beautiful vistas and roads were well-surfaced, though once we turned off the highway the route was no less than an off-road trail! But the Apaches surprised us pleasantly, taking all the beating without breaking a sweat, the RR 310 included, and all bikes were in ship shape even after the near-70km to and fro off-roading experience. 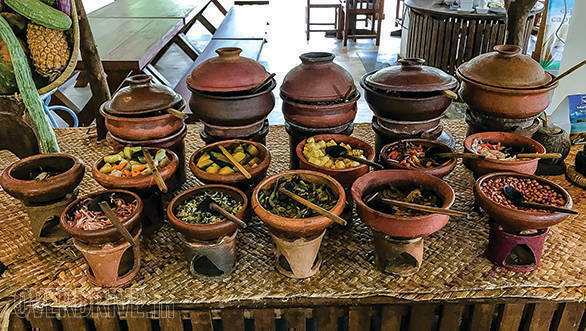 Lunch at Meemure was traditional Sri Lankan one served in earthen utensils and was lip smacking to say the least. Post lunch I jumped onto the RR 310 and as I'd discovered on our long term test bike itself, ergonomics are sporty yet comfortable enough to let you ride distances. This makes the RR 310 well-suited to commuting, sport riding and touring as well. The bike is addictive in the hills with 34PS on tap and the well-tuned suspension. Higher engine refinement levels were apparent instantly, as were the slicker shifts from the six-speed gearbox. Braking performance, feel and feedback were a notch higher than the 200 too. The seat felt a lot more comfortable and accommodating as well, adding to the 310's touring credentials. But after the blistering pace afforded by the RR 310 on day 1, the next morning saw me pull a long face as my bike for the day was the Apache 150. A bike with half the displacement and less than half the power as compared to the 310! That said, the compact dimensions and light weight helped me tackle the horrendous morning traffic in Kandy well. Once we hit the highway, I realised the Apache 150 is best suited to city riding though, as I was constantly trying to catch up fellow-journalists who were riding the faster Apaches. The second half of the day was wee bit better, as I swapped the 150 for the last generation RTR 160, which offers a slightly better top end grunt. Our destination for the day was Trincomalee on the east coast of Sri Lanka (Colombo is diagonally opposite, on the west coastline). Roads were empty, meaning throttles were wrung to the stop, most of the time. None of the bikes showed any hints of stress though, taking all the thrashing well, which speaks a lot about the reliability of the TVS engines. And while the RTR 160 was reasonably comfortable cruising at a shade under 100kmph, admittedly I was looking forward to the next day when I was to ride the Apache RTR 180 and RTR 160 4V. And day 3 was the longest as we rode all the way back to Negombo, a beach town on the western coast, near Colombo. The distance was just under 300km and the RTR 180 I started the day with felt better than my steeds the previous day, though its engine did have vibration similar to the smaller Apaches. 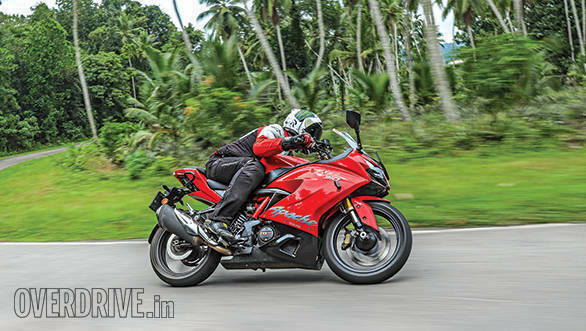 I was all smiles post lunch, once I got onto the Apache RTR 160 4V, which was unanimously voted the best package overall. Why you ask? The new 160's engine is not only far more refined but is also more powerful than its predecessor. This allowed me to keep up with the RTR 200, while offering better comfort thanks to the smoother engine. Its gearbox feels a lot better too as it called for lesser effort and offered slicker shifts. The revised riding position is more comfortable as well with the one-piece handlebar and single seat. Admittedly, the RTR 160 4V was second to none overall, save for the RR 310! That speaks a lot about its engineering and the efforts gone into further refining a platform that was a huge success already. In fact the Apache RR 310 and new generation RTR 160 4V pretty much delighted us on the final day of our ride, when rode the bikes on the Kanway Autodrome, a 1.4km long race track. The circuit isn't used very often and the tarmac quality isn't anywhere close to as good as our race tracks, but the layout and corners made the track a lot of fun. Most corners allowed braking really late and taking a late apex though the surface was slippery, calling for caution. 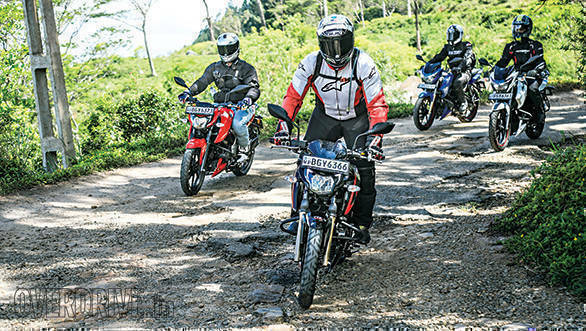 The RR 310 was the most fun, being the quickest bike with its performance and handling and of course its stickier Michelin tyres, while the RTR 160 4V was up there with it in terms of the fun factor, followed closely by the RTR 200. The ride in Sri Lanka wasn't exactly an eye opener as I've been riding the Apache series for years now. 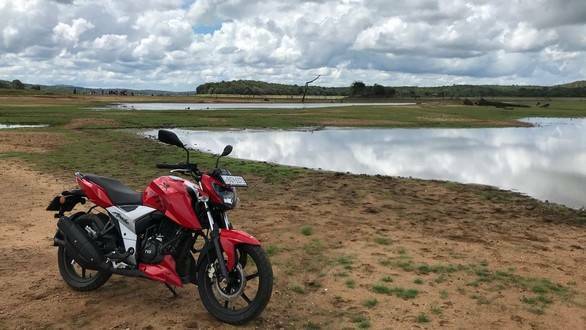 But the ride helped me realise that TVS Motor has been working constantly in improving the motorcycles and the newer Apaches bear testimony to its efforts in heaps. Of course, TVS Motor's partnership with BMW Motorrad is clearly working as a catalyst, helping TVS Motor improve the bikes' quality, engineering and overall feel significantly. And that's something that's seen on all the newer bikes, not just the Apache RR 310. No wonder there's 30 lakh of them on the road already!